What Camera Settings Should I Use??? What Camera Settings Should I Use for........??? 1.B. Not all camera sensors are equal. Sensor dimensions may matter only somewhat (the same way film format mattered in the old, analogue days), but pixel sizes surely do matter dependant upon your specific application. 1.C. Your night sky may be very different from mine in respect of light pollution, steadiness and transparency. 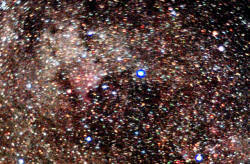 A.1: The Double Cluster in Perseus. Cassiopeia is to the right.Click to see larger image: Aberrations with lenses used wide open. An old, fast prime like the SMC Pentax-M 50mm f/2.0 is fine for many purposes, but may be prone to annoying aberrations such as coma. But as with any hobby, start with what you have to see if this is really something for you. Buying a lot of gear first and then starting asking questions afterwards may well prove both costly and inefficient. Or, said in other words: If you cannot produce any decent image of the starry sky with merely your camera, your kit lens and a tripod, then astrophotography is most likely nothing for you. Is the air slightly hazy but very calm? Could be good for some lunar and planetary photos, but not good for deep sky faint objects. Is the sky very clear but turbulent - i.e. : Do the stars twinkle? This will be no good for lunar and planetary detail (that will be smeared out), but could be fine for wide field constellation and lunar-stellar landscape photography and possibly also for some deep-sky photography. Is the sky light polluted? You may yet be able to capture bright deep sky objects, but it will be poor for meteor or star trail photos. And then, when you evaluate your photos, keep these observations in mind and you may sooner than later discover that you gear is basically OK - within its limitations - but that there are just nights other than merely those with total overcast where one should rather forget about the photography projects planned and do something else instead. 2.C. And above all: Don't expect perfection from day one. Be prepared to experiment and to learn by experience. Astrophotography is like walking: It's quite simple, but you have to learn it first - and you have to crawl before you can walk. When I started out in the early eighties, there were no instant digital view and analogue film was a quite costly affair. Today, one can shoot as many variations as one would like at no extra cost and the only serious issue will be how to find the delete button after evaluation of the results of one's session under the stars. 2.D. Expect that you will have to do some post processing (contrast enhancement; "development" of faint objects using curves and levels; stacking) whatever kind of astrophotography you are doing. You will most likely be surprised to learn how much information your camera and sensor have captured in those rather dull and dark fames of yours. 2.E. And last but not least: Enjoy the stars while you are out there. Things will run sour once in a while (batteries depleted, remote breaking down, tripod shaken after minutes of careful guiding, clouds come marching in just as you have finalized your preparations........). But the beauty of the starry sky will still be there. And at last, then, to some practical suggestions for your camera settings as a starting point - and a starting point only - for your own experiments. In my view Constellation Photography is by far the easiest subject. (No, the Moon is not the easiest). All you need is a camera, a decent wide angle lens and a tripod. Due to the rotation of the Earth, the stars move over your head. Details are given in the following tutorial but what you need to know for a start is that this movement will cause the image of a star near the celestial equator to be dragged out by some half pixel width per second for each 25 mm of focal length (on a typical APS-C sensor). Sixty degrees away from the celestial equator that movement will be reduced to half that value and near the celestial pole the movement will be nill. Thus, with a 28 mm lens you may expose for up to 20 seconds before star trails become obtrusive but with a 300 mm lens you limit is some 2 seconds (near the equator) to 4 seconds at 60 degree declination. Stars are point-like sources of light. They record on your sensor proportional to the physical dimension of your aperture. (For details, please refer to the following tutorial). They produce a point-like image on your sensor and they are all infinitely far away. So you have no issues with Depth of Field or similar. And the faintest stars that you can record at, say, f/1.7 will take 22 times the exposure time with the same lens to record at f/8 and 42 times at f/11!!! So why the often heard advice to stop down your costly, fast wide angle lens a good deal??? Don't ask me, because I never do. The only reason to stop down - A BIT - can be, and quite often is, that fast wide angle lenses were never designed with point like stars in mind and hence produce some annoying aberrations, in particular coma when used wide open. 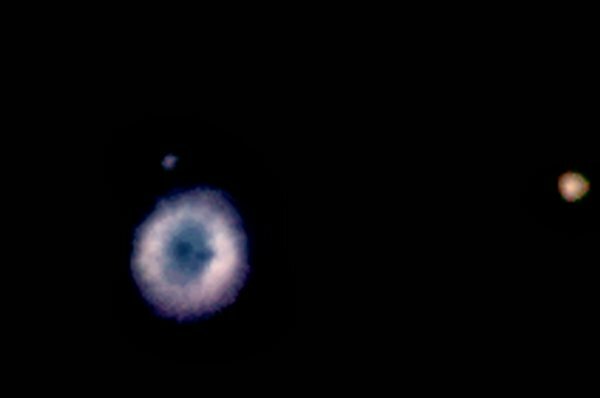 It should be noted that these examples as well as the ones below were taken with the camera on an equatorial mount in order to produce strictly comparable results. Thus, there are no star trails (not much at least) here as there would have been with the camera on a fixed tripod. Still, the overall principles do apply about how to expose in order to capture equally faint stars. Afraid of high ISO Noise? Well, the following sequence was taken with the same set-up as mentioned above. All noise reduction routines were disabled (long exposure as well as high ISO noise reduction) and here is the result for ISO variations between 320 and 1600. All taken at f/5.6 and 30 seconds. (The 5.6 value was chosen for later - yet to come - comparisons with larger lenses at the same f-ratio). Now, remember that the K200D isn't exactly a modern camera at this time of writing (autumn 2011)More modern cameras handle (much) high(er) ISO even better and yet, you can go quite high under a heavily light polluted sky and get very acceptable results with many stars recorded. 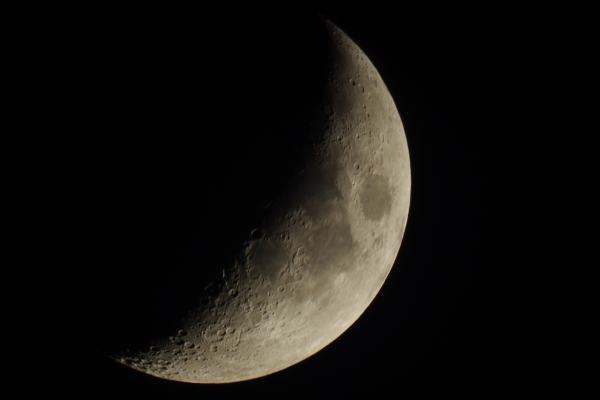 So, the obvious advice to the beginning DSLR astrophotographer is: Do use that high ISO capability of your camera. Once you have convinced yourself that you can indeed capture faint stars under almost any conditions, it is time for experiments with both ISO settings and post processing as shown in Tutorial 1 and Tutorial 2 about stellar photography under a light polluted sky. But as long as you don't have an accurate equatorial mount, high ISO is and remains a good thing. It is the astrophotographer's assistant - not his enemy!. For me, the conclusion is obvious: Why spend 30 seconds at f/11 to get what you can get better in 4 seconds at f/2.8??? Choice of Lenses: Size Does Matter!!! One final note on stellar photography at this point: If your goal is to capture many faint stars you have to consider the absolute aperture size (or, strictly, rather the Entrance Pupil). While aperture ratio matters a good deal for extended objects like nebulae and galaxies, only physical aperture determines how faint stars you can capture in a given amount of exposure time at a given ISO. That is because stars are point-like sources of light. --- and thereby you've also got some kind of lens recommendations. The Moon is a sunlit piece of rock. It only looks glaringly bright in contrast to the surrounding sky, but it is essentially, exposure-wise a day light, extended (not point-like) object and as such there isn't much difference to ordinary landscape photography. As with landscapes, the direction and altitude of the sun over the landscape plays an important role. One other thing to take into account is the Moon's altitude over the horizon. That altitude which can vary a good deal, especially for the full and gibbous Moon and atmospheric extinction may vary the brightness considerably accordingly. But within these variances it should be possible to establish some general rules for proper exposure settings. Right? Right! To a certain extent! There is no such thing as "correct exposure". 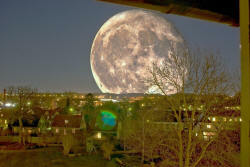 The Moon is a High Dynamic Range object, so what is "correct" here? You lens may only be sharp after stopping it down somewhat. Atmospheric transparency will vary unpredictably. And so on....But there are guidelines that may form starting points for your trial and error shootings. Rule number one for lunar photography is shoot, shoot, shoot and keep on shooting. Out of many pictures taken, some will be good and on the best of nights a few will be excellent. 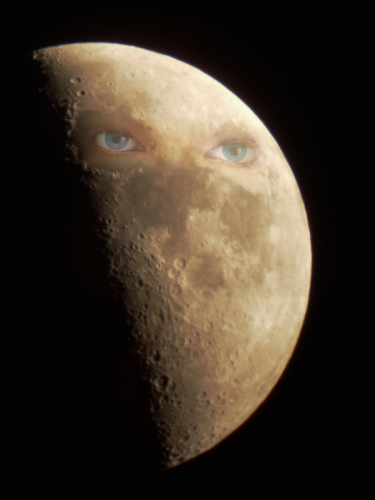 c.2: The Moon can be a challenge due to the limited dynamic range of digital cameras - that is, if one wants to show detail from the dark side of the terminator region while at the same time avoiding washing out or overexposing the sunlit side and bright craters. Right: High Dynamic Range (HDR-)image composed of the foregoing plus a stack of 10 images at 1/80 s and ISO 500. 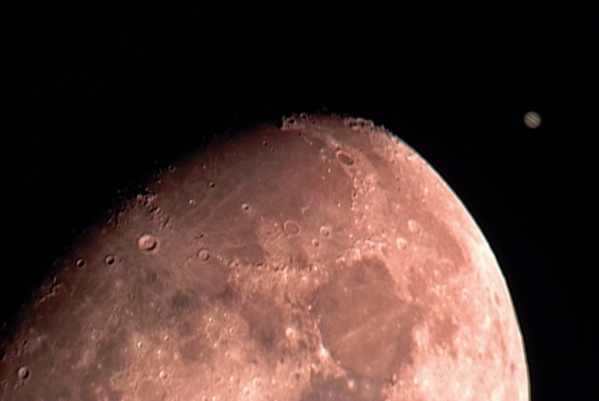 Images taken with a Pentax K200D and a Vixen Polaris R 100L (a 4" f/10 Newtonian telescope). Images are full, un-cropped frames. Click on thumbs to see larger images. Re-iterating that this is merely basis for your own tests and experiments, is that then all there is to lunar photography? No, there are a few more things that you should consider in order to increase your chances of success. Within + 2 arc minutes the Moon's diameter is always half a degree in diameter in the sky, which means that the image size on your sensor will be 0.0087mm times your lens' focal lenght. Thus, a 200mm lens will produce an image that is only 1.75 mm wide - some 300 to 350 pixels on most DSLRs - which isn't an awful lot. According to Dawes Limit my favourite 200mm f/3.5 (57 mm entance pupil) Tamron lens can at best resolve objects two arc seconds apart - but that distance will be a mere 1/3 pixel width on my sensor. Now, the smallest craters and other features on the Moon are indeed about a few arc seconds small and therefore, to capture fine detail on the Moon there is no way around lenses with larger focal lengths from, say, about 400 mm and upwards. If your best tele lens is shorter than that, use a good tele converter! So, I use a long focal length, possibly with the aid of a tele converter, at the expense of slowing down my system to perhaps around f/8 to f/11. What about the Moon's movement over the sky and my longer exposure times? Well that movement results in a trail of the image on my sensor equal to less than 0.00007 mm X Focal Length per second. I.e. : with a 500 mm system and a 1/30 second exposure, the lunar image will trail 0.001 mm during the exposure - or just about 0.2 - 0.3 pixel widths in that 1/30'th of a second. So, as long as I can restrict myself to exposure times under 1/15 second, I really don't care about the Moon's motion over the sky. Atmospheric turbulence, in astro jargon called 'poor seeing' can be a serious threat to the quality of lunar images, because that turbulence cause perpetual shifts in focus and position and thus, tend to smear out that fine detail which is so important for a successful lunar image. c.4: The effect of poor seeing. Animation of 3 movie frames recorded within less than 1 second on 29 January 2012. A fourth frame, being a stack of 421 frames from the same movie, has also been used for the animation. Therefore, unless you are geared to do some stacking, you should avoid the longer exposure times after all and try to place yourself in the faster league from about 1/125 seconds and faster. So, use as fast an aperture as the quality of your lens allows. Why stop down on an infinitely remote subject with no DOF if you don't have to?. IF you use the longer exposure times after all, you should be aware that the flip of your mirror (in a DSLR) causes vibrations and air movements that will be noticeable as a degradation of image quality too. Therefore, the use of mirror lock-up is (always) highly recommended. The fashion in contemporary amateur astronomy magazines is to predominantly present showpieces obtained through hour-long, multiple exposures with advanced, dedicated CCD cameras for astrophotography. This is kind of a pity, because thereby they indirectly belittle the good old news that very satisfactory results in deep-sky photography can be obtained with simple everyday telephoto lenses and an ordinary camera. The good, newer old news is that vintage prime lenses very suitable for deep-sky astrophotography can now be had at very affordable prices. Additionally, the advent of digital cameras with exchangeable lenses a has made high ISO exposures of manageable duration and subsequent image processing a breeze. When I started out in the days of analogue film, experiments were a costly affair involving a lot of anxious waiting time from exposure to development and examination. Today, with a digital camera, experiments are fast and free. There is just one "snag": Deep-sky objects are dim, usually fairly small (in angular extent) and may often conspire to mingle with the light-polluted sky. Therefore, you will need a fairly long focal length and reasonably fast lens, quite high ISO and fairly long exposure times --- and, therefore, you will need an equatorial mount to track your subject over several (tens of) seconds of exposure time. simple, lightweight and fairly cheap or more robust and advanced. Both can often be found used at a bargain price. Your first photos may (read: will most likely) look discouraging dull to you with little "deep-sky" in it. Here comes the true benefits of digital photography: Image processing has never been easier - and you don't need to do an awful lot of processing - just a few, simple steps will usually do. This is a subject in its own right and I have devoted a separate tutorial to this subject that you may find here. Mount camera plus a decent telephoto lens on your equatorial. I recommend a 135-200mm f/4 (or better) lens to begin with. Fine results can be achieved with longer f/5.6 or even f/8 systems, but the shorter focal lengths are more forgiving in case of small tracking errors and the faster f-ratios obviously require tracking for shorter periods of time. Set your cameras exposure time to somewhere between 15 and 30 seconds (depends upon the degree of light pollution). Set it for as long as the sky glow and your tracking accuracy allows. Find your target - now THAT can prove frustratingly hard to begin with. You will have to learn your way around the starry sky. The use of a finder scope is also highly recommended as you will most likely not be able to see your target in the camera's viewfinder. Make some 20+ exposures in rapid succession and then a few dark frames with your lens cap on. - and then it is just to go inside and do some stacking and post-processing. Turn off all in-camera noise reduction that you can. You don't want your camera to mistake faint nebulae for colour or luminance noise and you don't need dark frame subtractions for each frame that you take. Use mirror lock-up if you have it. The faint deep-sky objects themselves may not take any harm, but brighter stars in the field may produce unwanted effects due to mirror vibrations. Use cable or remote release to minimize the risk of vibrations. The longer the focal length, the more care is required. If you don't have it already, get a good electronic sky chart. You will need it when you try to find your target in the sky --- and also at times afterwards, when you try to find it in your image! If you have a very good Equatorial Mount and a very dark sky, try lower ISO and longer exposure times once you have gained confidence that you and your gear can indeed capture those faint, elusive objects. Under all circumstances: DO NOT STOP DOWN THAT LENS more than absolutely necessary. If you lens shows much softness and grave aberrations wide open, then consider getting a better lens right away. Those scarce photons have travelled for thousands or millions of years to reach your aperture. So, why show them the door when they finally arrive? D.3: M57 shot with a Pentax K200D and a Tamron SP 350mm f/5.6 (Adaptall-2 system, Model 06B) telephoto lens. 12 images of 30s at ISO 1600 stacked in Registax and post-processed in PhotoImpact. The image shown is a rather "un-scientific" 485% (!!!) crop. Click on image to see a more "realistic" 200% crop. Of course, astrophotographers with the "real gear" have produced and always will produce far better images of objects like this. But to me, it is still very rewarding and plain fun to hunt down these tiny, elusive targets and see, how much I can actually get out of them! Well, I assume most people have seen stunning pictures of the Milky Way band taken with wide angle lenses. And the Milky Way is indeed the obvious deep-sky object for the wider angled lenses from about 100mm FL and downwards. That is, if you have access to a truly dark sky. I'll come back to that in a moment. But other than that, the smaller lenses have little to offer in respect of deep-sky photography. Still, if you are the type that feel the thrill of discovery, simply finding and identifying tiny, weak smudges as known and named deep-sky object, those "little offerings" may suffice. As an example, here we have a star field around constellation Triangulum taken with a Cosina MC Cosinon-W 35mm f/2.8 lens and a Pentax K200D. Exposure was 30s at ISO 1600 and lens wide open. D.7: And the much more elusive galaxy, M33 in Triangulum. (I admit, here you have to be kind of a believer). Note the little "trick" in Figure B. above: Stretching levels may at times be the direct route to enhancement of astro photos. That will far from always be the case but it is always very helpful for a first evaluation: Did I capture any of, what I was after??? As mentioned in the box above you will find more about post processing of astrophotos in Tutorial 1 and Tutorial 2 on Stellar Photography and Light Pollution. Back to the Milky Way: I am one of the many, that don't have access to a truly dark night sky. But once in a while there comes one of those nights where the air is a tad more transparent and thus also a tad darker (less light from the ground scattered in the air) nights, where it seems worthwhile to try a long shot. D.8: Original image. Not much indication of a Milky Way here. Unfortunately, an air craft condensation trail interferes in the lower left as will become evident in the following images. D.9: But do the same trick as above in D.5 and yes, I did capture the Milky Way, where it splits in two lanes just below star Deneb in constellation Cygnus. D.11: And a cropped stack of 6 images, likewise enhanced, clearly shows, that I have indeed captured the North America Nebula also - a first time ever for me. An equatorial mount (plus a dark sky) would have been better and these images will never win me any magazine awards or any photo contests. But I do enjoy the glory of the starry sky as I make them - and sometimes they do give me "the thrill of discovery"! Let's face it: Digital consumer or prosumer cameras weren't designed with capture of fine planetary detail in mind. Planets may be very bright (Venus, Jupiter), reasonably bright (Mercury, Mars, Saturn) or rather dim (Uranus, Neptune) but they are all VERY small in angular size as seen from our observing point here on planet Earth. E.1: Image sizes of Jupiter simulated at maximum angular size (48" - 48 arcseconds) at various effective focal lengths (EFL) as it would record on my Pentax K200D sensor (23.5 x 15.7 mm / 3872 x 2592 pixels) with a pixel width of 0.00606 mm. Inserted for comparison is a true photograph of the Moon (30 arc minutes - or 1800 arc seconds in angular diameter) at EFL = 700mm and f/11 with the same camera and a Tamron SP 350 mm f/5.6 lens, (Model 06B) plus a 2X teleconverter. 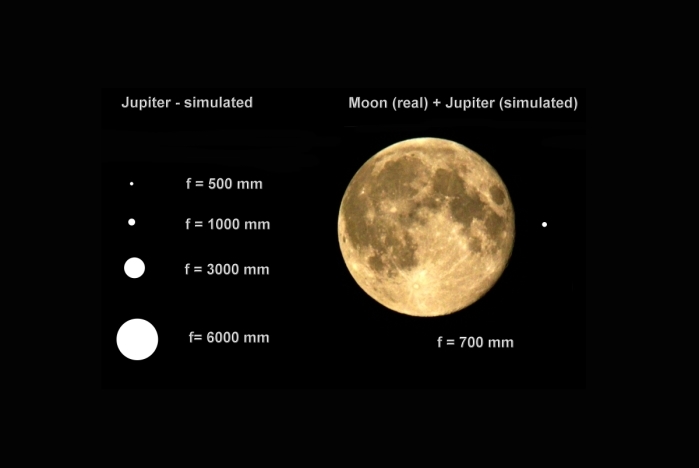 As can be seen from figure E.1 above, even the longest "standard" telephoto lenses in the 500mm to 1000mm range will hardly be able to show giant Jupiter as more than an perhaps somewhat overexposed bright star. Only Venus (64") may surpass Jupiter in angular size; Saturn (21") including its ring system (49") will be more or less equal in size to Jupiter while Mars at its most favourable opposition will be 50% (25") of Jupiter maximum size. Mercury at its best will be some 13" while Uranus and Neptune are 3.7" and 2.5". Note, these are the maximum angular sizes at the planets' smallest distances from Earth. Normally, they will be smaller than that! Thus, as long as we are restricting ourselves to conventional photographic lenses, we are definitely in the realm of photographing point-like sources of light as in section B on Constellation Photography above and thus, exactly the same rules apply. E.2: Mars captured with a 350mm f/5.6 lens; 1 s and ISO 1600 - how very interesting! As you can see, there is a place for both large and small cameras and for long and short lenses in this kind of planet hunt. But I Want to See Planetary Detail ! E.8: The Seductive Powers of Imagination and Wishful Thinking. After Schiaparelli published his findings of 'canali' on Mars around 1870, a great many astronomers could also see and draw these features. The illustration on top is from Koppel's Atlas of the World - Danish Peace Edition, 1922. 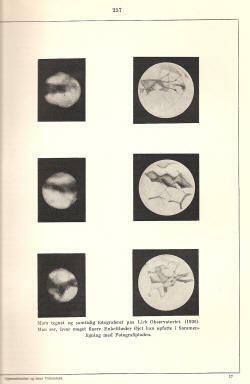 The figure reproduced at right is from a 1936 popular textbook on astronomy and the caption reads: "Mars drawn and at the same time photographed at Lick Observatory. (1926). One notes how much finer detail the eye can perceive in comparison to the photographic plate." Well, these 'canali' were a topic of scepticism and debate all along, but at least after the Mariner 4 fly-bys in 1965, no one would ever more see or draw 'canali' on the Martian surface. If you want to photograph planetary detail you will have to go beyond conventional combinations of conventional cameras with conventional (tele) lenses. Take a look at Figure E.1 above. 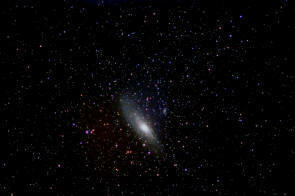 At 1000mm focal length,it seems that we have an appreciable, though still very small, disk. But it is only less than 40 pixels in diameter with the specific sensor discussed (pixel size = 0.00606mm). So, in terms of the combined lens + sensor resolving power, we could at best see points and structures separated by some two or three pixel widths which in this case amounts to (3/40)*48" = 3.5" (arc seconds). That is in case of excellent seeing. R = 116/D, where R is measured in arc seconds and D in millimetres. ....provided that the focal length, F of that lens is adequately long. Because a 2.5" object will produce an image, on my sensor that is 0.000012 * F wide. And with the pixel width that I have, that image will be 0.002 * F pixels wide. Thus if F is smaller than 1000mm I shall certainly not be able to split anything near the resolving limit of my "ideal" optics. Lens (whether diffraction limited or not) resolution increases with aperture and total system resolving power decreases with increasing pixel size. So, there seems to be two ways to go: Go for smaller pixel sizes, of which I have no experience, but the best amateur planetary images are produced by large telescopes and web-cams with their small pixels, stacking hundreds and hundreds of video frames. Or, you can increase your focal length. It all boils down to the issue of proper sampling, which you can read more about on this excellent page. where p is the pixel width measured in millimetres and A the planet's diameter in arc seconds. E.9: My "Planetary Camera" with an EFL of 2900 mm: A Vixen Polaris R 100L 4" f/10 Newtonian telescope, an ASTRO 2.5X apochromatic Barlow lens and a Pentax K200D DSLR. The Barlow lens used is a nominal 2.5X, but with T-Ring, focus tube adapter this and camera's dimensions I get a slightly longer EFL in the actual set-up. E.10: Jupiter and Moons - uncropped image - 15 seconds exposure time. 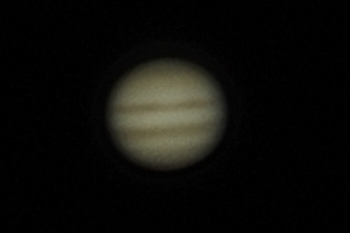 E.11: Jupiter - uncropped image - stack of 20 exposures at 1/15 second. Images were taken on 25 October around UT = 22:30. From left to right we see: Io, Jupiter, Europa, Ganymede and Calisto. Optics was as in Figure E.9 mounted on a Mead LX75 equatorial mount. Images were taken from the midst of a city, but with fair seeing on that night (actually unusually good for my place and this time of the year). E.12: Composite image of E.10 and E.11 above. I have deliberately omitted any cropping in E.10 and E.11 to show actual disk size, ref. the simulations in Figure E.1 above. 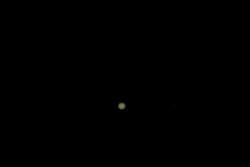 A 100% crop of Jupiter in E.11 is shown below. Click on image to see a 400% crop. Such a crop will not reveal any "hidden detail" with my resolution but may be convenient for screen views at a larger distance? Finally note that with an exposure time of 15 seconds in Figure E.10 - needed to capture the moons of Jupiter - and the EFL of 2900 mm, the planet would have drifted 520 pixels or 3.2 mm without tracking. Now the equatorial mount is not only a convenience but an absolute must! So, with the smaller planets - or the larger in a less favourable position than closest approach to Earth - the rest is easy? Just crank up focal length even more and we should be home safe??? Behind the (approximate) expression for Dawes Limit on lens resolution discussed above lies the fact that the bundle of parallel light rays from a point-like light source will never form a point-like image at the focal plane of a lens. Due to the finite aperture of the lens, the rays will be diffracted and interfere with each other to form a pattern in the focal plane of a central dot surrounded by dark and bright rings where the brightness of rings rapidly decrease in brightness with the distance from the centre. They will form an Airy Disk. where λ is the wavelength of the light, F is the lens focal length and D is the diameter of the lens. Now, pause for a moment and digest this: The "blob" image of a point-like source such as a star grows in diameter proportional to the f-number as we stop down the lens. So, by stopping down our lens we are not only blocking the way for light to enter into our camera; that little light that is allowed to enter will be spread out over a larger area = over more pixels giving less photons in the individual pixel element and thus, dimming the image even further. "Stop down your lens" may be a quick-fix for not-so-perfect lenses in terrestrial photography but it is no good recipe in astro photography. For my little 4" f/10 Newtonian shown in E.9, I have A = 0.0134 mm = 2.2 pixel widths on my K200D and in the configuration shown with a Barlow Lens (EFL = 2900 mm - f/29) I get A = 0.15 mm = 6.4 pixels. Reducing pixel size will certainly not help with growing "blobs" at increasing f-numbers as it would when we discussed focal lengths and adequate sampling. My vintage (1982) Vixen R 100L Newtonian telescope is a very simple design, but it has an excellently crafted parabolic mirror (not all Newtonians in its class can claim that today!!!). It is a long-focus (f/10) system with a small secondary obstruction and is fair to assume that its resolving power is pretty close to 120/100 = 1.2 arc seconds. But is is indeed arguable whether it will make much sense to increase the EFL beyond 3000 mm: At that focal length objects that are just split will be a bit less than 3 pixel widths apart on the sensor and the Airy Disk radius will be just a bit more than 3 pixel widths. I can increase the EFL and get a larger image, but that image will not contain more information. I will just see whatever blur there is at increased magnification. I have run into empty magnification. Only, the fuzziness will be come more visible in an image that was dimmer and therefore took longer time to expose and gave poor seeing more time to play its hand. The only way to get better images is to increase the lens diameter as EFL is increased and thus, to keep the f-number at a reasonable level. Planets aren't point like sources of light; they are extended - though small - objects but the hairline thin, fine detail on their disks will suffer from diffraction softness and empty magnification as well From what I have seen (and heard), "sensible" f-numbers are limited to about 60 - or maybe 70 although I have my doubts - and below. It is quite easy to increase the EFL. Knowing what I now know, it should also be possible for me to restrict myself and only increase EFL with a sensible range - that is a range that will first and foremost be dictated by the aperture of my lens / telescope objective. There are essentially two ways this can be done: With negative lenses (Barlow Lenses and Tele Converters) or with Eyepiece Projection. 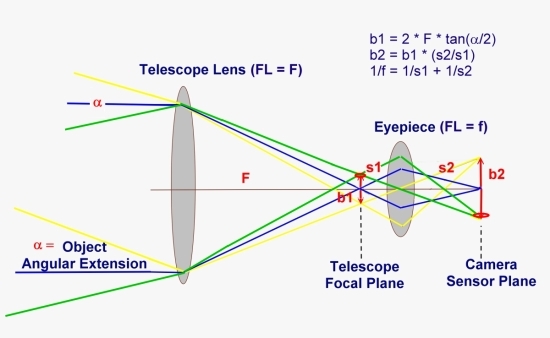 A Barlow lens is a negative lens increasing the focal length of a lens (typically by a factor 2X or 3X)without adding many inches to the overall optical path of your system. It is quite similar to a common photographic tele converter and works the same way. In fact, with a T2 adapter both may be coupled to most telescopes. We have already seen a 2.5X Barlow lens in action in Figure E.9 above as well as the results in the following Jupiter images. As always, you get what you pay for and you should go for the better, 3-lens air spaced apochromats. They need not be terribly expensive (mine wasn't!) and you won't regret the small extra expense. In E.14 we see a combination that I have used with good results. With this combo I get an EFL of some 5800 for my Vixen Polaris R 100L Newtonian - and f/58 is surely about the maximum useful f-number with this system. Suppose that you have a fast telescope with a significant larger lens, say an 8" f/5 Newtonian. Then you may want to increase your EFL by a factor of about 10. In that case, stacking of Barlows and TCs isn't really the way forward. In E.14 above, we already have 3 (Barlow) + 7 (TC) individual lenses involved and a corresponding number of air-glass interfaces to introduce scattering, damping and internal reflexions. E.16: Lower left: Vintage Carton Eyepiece Projection Adapter of a rather sophisticated design with internally moving eyepiece that allows for variable projection distance. 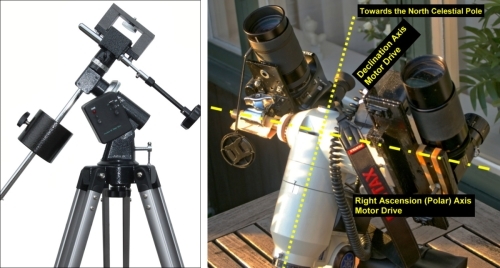 Lower right: Contemporary ASTRO basic Eyepiece Projection Adapter with fixed eyepiece position. Both couple to the camera with a T2 Camera Adapter and both may be expanded with T2- or camera mount specific extension tubes for longer projection lengths. So, get one of those adapters and you are ready to reach your desired Effective Focal Length (EFL). By changing projection lengths or eyepieces or both you can achieve almost any magnification of your heart's desire. For example, if you want to boost the EFL of an 8" f/5 system (FL = 1000 mm) to 10.000 mm with your 20mm eyepiece you will need M=10. With a 20mm eyepiece you find that you will need L = 242 mm; S2 = 220 mm and S1 = 22 mm. An L-value of 24 cm is actually quite a lot considering that you have a fairly heavy camera hanging in the air on a 24 cm long lever arm that will set the whole system easily in vibration - and that at high magnification!. Try focusing and pressing the release button in such a situation and you will know what I mean. It will work better with a 10 mm eyepiece in this situation requiring L = 121 mm, S2 = 110 mm and S1 = 11 mm. But under all circumstances: Use a heavy duty mount and tripod/pier; use mirror lock-up and use remote release. And as always: You need quality optics - including the eyepiece! What you don't need is an ultra-expensive ultra-wide one. Your target remains very small and quality Plössls or - probably better - quality Orthoscopic eyepieces with their apparent field of views around 45 to 55 degrees are what you should be looking for. Knowing what we now know about sampling, resolution, pixel sizes, aperture diameters and focal lengths, it is fairly straightforward to set up (and hopefully to understand the rationale behind) some rules of thumb for photographs of the planets of our solar system. All, we need else is knowledge about the planets' angular diameters and surface brightnesses. A planet, in particular one of the innermost and nearest, may vary significantly in size and brightness from time to time and also from one opposition (or conjunction) to another. Their orbits are more or less eccentric and not co-centric with that of Earth's orbit. For example, Mars at opposition may vary in size from a meagre 14" to a whopping (unfortunately very rare) 25". And at its very smallest appearance at conjunction it will be a lousy 4" only - beyond detailed planetary photography for the ordinary amateur. With this in mind, here is a set of proposed settings in tabular form, assuming an ISO value of 500 and an average pixel size of 0.005 mm. From these suggestions, you may extrapolate to your own optics and ISO preferences. Again, this is not exact science, but merely guidelines for your own continued trials with your own gear and under under your own sky. E.17: Saturn photographed with a Bresser Messier AR-90 refractor with 900mm focal length and a Pentax K-5 DSLR. Single exposure of 10s at f/10 and ISO 1600. E.18 :Saturn photographed with the same equipment as in E.17 together with a 2.5X APO Barlow Lens giving an EFL of 2300mm. Stacked images of 1/6 s at f/25 and ISO 1600. Note in E.17 that four of Saturn's brightest moons are also captured, forming a nearly straight line from about the lower left to the upper right corner. Image E.18 is a stack of 17 identical exposures in Registax and post processed in PhtoImpact. 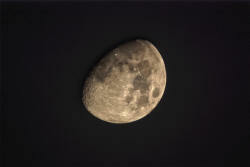 E.17: The Moon photographed with the same camera and optics (2800 mm f/28) as shown in Figure E.9 on 5 November 2011 at UT = 21:40 and with a photograph inserted of Jupiter taken the same night fifty minutes later. The Lunar image ís the full, un-cropped frame and is a stack of 6 exposures of 1/10 second each at ISO 500. The Jupiter image is a stack of 12 exposures of 1/15 second and ISO 500. Back to our own cosmic front yard again. And back to a target, where satisfactory results can be achieved with the simplest means: A telephoto lens, a camera and a tripod - PLUS one additionl, indispensable item: A SAFE solar filter. F.1: Sunset at Horbaek Beach - Midsummer's Eve 2010. No doubt, many have tried to photograph one of those beautiful sunsets where one can actually see the solar disk without pain and strain to the eye as the sun approaches the horizon. Such sunsets are actually quite rare, where the atmosphere co-operates being reasonably calm and yet so opaque due to haze and dust/smog that it attenuates the light from the sun to a tolerable level. Unless you know how to read the atmosphere, such photography is not without risk: Notice how the sun is burned out at its top - just half a degree above the horizon. Lift the sun up a bit further, and the atmospheric attenuation diminishes to a level, where the sunlight may cause serious and permanent damage to your eyes. Further, while images like F.1 may be fine for landscape photography, they cannot qualify for astrophotography. Notice how flattened the sun is due to the refraction effects of the atmosphere; the closer to the horizon, the more light rays are bent upwards. In fact, if Earth were without any atmosphere, the sun in F.1 above would actually lie just below the horizon at the time this photograph was taken. Further, as shown in Figure A.2 in the beginning, here is where the atmosphere is most turbulent and where details on the solar surface will be all but impossible to capture photographically. So, a filter is a must, and not any filter. (or some much more sophisticated and costly devices that are outside the scope of these pages). To be safe, your filter has to block 99.999% of the sunlight from entering into your lens, i.e. to have an optical density of 5.0. By all means: You need a filter in front of your optics - not a rear filter near the focal point of your lens. And you don't want to have a dark filter of the welder's glass type because dark filter work by absorbing the light and thus building up heat and unwanted air currents in and around your optics. You need a reflective filter that attenuates the light entering into your lens by reflecting off the 99.999% of the light falling upon your filter. F.2: Simplistic sun-filter solutions: Filer foil glued on 58 mm Hoya protect filter for my 300mm f/5.6 Tamron Model 54B (left) and on a cardboard-and-glue homemade filter holder for my 350mm f/5.6 Tamron Model 06B (right). Your means available and your own imagination will be the best guideline here. Anyway, if I can make such, so can you! Use a stable tripod (if you don't have an equatorial mount); use mirror lock-up and cable/remote release and, preferably, do some stacking to bring out the finest details. with a SAFE solar filter of optical density 5.0!!! - in other words our exposure time, t would be approximately 1/100 to 1/125 s. Note that without the 5.0 filter our calculated exposure time would become 1/11.000.000 s !!! The sun IS bright - very bright!!! Anyway, with the proper filter, this is indeed a good starting point for "shooting in" on this target. However, this is for the clear sun in a clear sky. As we discussed already in the beginning - and reference the comments to Figure A.2, F.1 and F.3 - the atmosphere may attenuate the glare of the sun further. The nearer the sun is to the horizon, the more pronounced may this additional attenuation be. F.4 and F.5: The sun photographed (hand-held) a few minutes apart with a Pentax K200D, a Tamron 200mm f/3.5 Model 04B lens and a Kenko SHQ 1.5 Teleconverter. EFL = 300mm; 1/800 s at ISO 320 and f/6.75. (100% Crops - Click to see larger images). Note how the thin clouds/mist - invisible from the ground - reveals itself as a "halo" already in Fig. F.4 and how it surely reddens (attenuates) the sun as it thickens in Fig. F.5 - while at the same time it actually makes the tiny sunspots more readily discernable. A few more practical guidelines. The Sun always shows an angular size about 32' (arc minutes) which is the same as the Moon's maximum angular size (28' - 32'). Exposure settings for the Sun with a 5.0 optical density filter is also rather much the same as for the Moon so, you will use the same gear and techniques as discussed for the Moon above. Allow your gear and filter to equalize with the ambient temperature before you start shooting for earnest. For prolonged photo sessions heat due to the constant, direct sunlight may warm uo your instrument and cause local air currents and turbulence. This may be minimized by keeping the lens/scope in the shade or by covering the lens/telescope by a light coloured cloth. Do not shoot over asphalt/pavement/roof tops if you can ovoid it. Shooting over vegetation is to be preferred if possible. (I usually have to shoot from the midst of a city. Well, It works, but no doubt image quality suffers accordingly). As said, you can expect to photograph sunspot and granules. Protuberances and all that stuff is for owners of sophisticated filters and instruments, but it can be quite rewarding just to find groups of sunspots, to watch them move in latititude and to grow and decline over time. F.6 and F.7: Sunspots photographed on 25 September 2011 at UT = 11:39. Taken with a Pentax K200D DSLR and a Tamron 300mm f/5.6 Model 54B lens plus Tamron F-series Teleconverter. EFL = 600mm; f/11. Stack of 9 exposures - 5 of 1/125 s and 4 of 1/80 s - at ISO 100. Stacked in Registax and moderately contrast enhanced in PhotoImpact. F.6 is a 100% crop; F.7 is an enlargement of a section of same. (Click to see larger images). F.8: Condensation trails from an aircraft - unnoticed until "development" of the image. Single exposure. Same exposure details as above. Also a bit enhanced in post-processing. Of course, more images to stack, more aperture and longer focal length will improve detail. But now we know the way forward: A small telescope, an equatorial mount and some more filter foil and we are climbing one step up the ladder.